Black gold. It’s essential in the garden. Most choose the bovine poo, but there are many options to choose from, each with their own unique benefits. The question is, are you managing your manure in a safe way? Are your foods still safe to eat? With news broadcasts on TV about foods being sold that were contaminated with things like E. Coli. many people are now wondering if manures are safe to use in the garden. Less and less commercial farms are using manure in their operations. Should that be telling us something? Fresh manures can pose problems for gardeners and often times they don’t do what we intended when they are fresh. First off, the nitrogen is often too strong and will burn or kill plants. Often times it’s the wrong form of nitrogen and bacteria for what your plants need. Only with aging will it be the right balance. Secondly, manures are composting “greens.” If anyone remembers their composting 101, you need to layer your “greens” with your “browns” for effective composting. Manures work best when mixed with straw, wood shavings and dried leaves. Thirdly, fresh manure can contain pathogens and salts from the animal’s digestive tract. Neither of these things will do any good for your gardens and most will harm in the wrong run. Proper composting of the manure removes these “imperfections” due to the heat build-up of the pile. 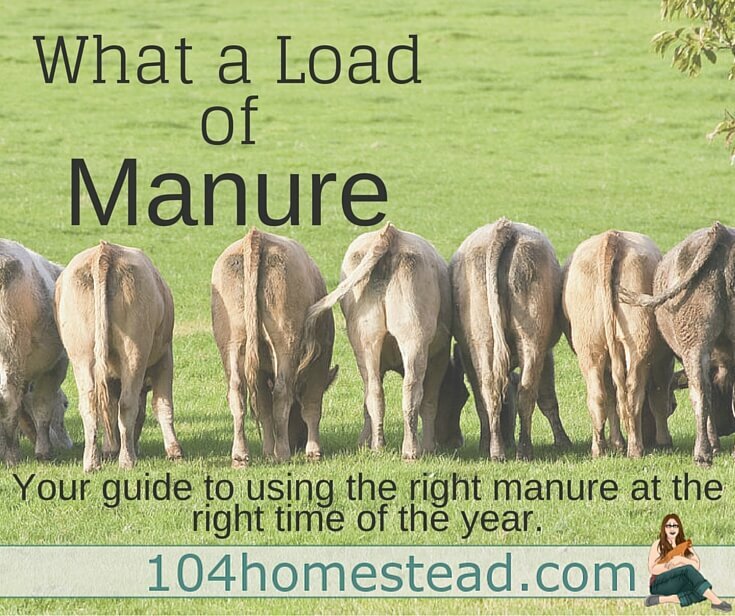 Manure is just one of the many ways animals contribute to a homestead. So which kind of manure is right for you? The highest of all manures in nitrogen and phosphorus. May burn plants if it’s not properly aged. Make for fabulous leafy greens. A good all-purpose manure. Lower in nitrogen so it’s less apt to burn plants, but also lacks the nutrients that other manures may offer. Another good all-purpose manure, but like with cows, it tends to be lower in nitrogen. There is also a risk of weed seeds remaining in the manure. A nice dry manure that falls somewhere between cow/horse and poultry manures in regards to nitrogen levels. Obviously, there are other types of manures available (goat, bat, elephant), but these are the most common. Cow, horse, and rabbit manures applied in early spring. Chicken, cow, horse and rabbit manures applied in both spring and fall. Chicken, cow, horse and rabbit manures applied in both the spring and fall. Cow and horse manures applied in early fall. So how much poo should you use? For conditioning your soil, a rate of 40 lbs per 100 square feet works well. For poor soils or new beds, you are better off doubling that. If you are just top dressing, a 1-2″ layer is more than sufficient. « Who Owns Your Food? Humanure(human waste manure), hog/pig manure & munure from carniverous animals(dogs/cats/other carniverous & omniverous animals)can be used for veggie gardens but must be “fully cured”by completely decomposing before use. If not it can be used on lawns & landscape plants or say in nut & fruit tree orchards, grape vines & berry vine plants. Also for added benefit letting (especially carniverous animal manure)age a year or two will 100% assure all parasites/harmful bacterias & viruses are gone.Hog/pig manure that is from hogs that have been fed a vegetarian diet can be looked upon as more safer than hog manure that is from an omniverous hog fed diet. fed garbage & animal scraps. Also if the hogs have no intestinal worms the manure would be safer & may not need “aging” a year or two.Now today 70% plus of pork has no worms. What about pig manure, is that any good? I haven’t used pig manure, so I’m not sure. Hi, interesting post. I use a mixture of compost and dried steer manure a lot. But I have found that worm composting and using the worm castings mixed with home made compost works at least equally well. Have you ever used castings? It is organic nitrogen, it will not burn your plants. “Worm” Tea can be made from it as well, again very nitrogen rich. If you haven’t tried worm composting, you may enjoy it, they really are amazing little creatures. Great Post! Hello Jessica,missed you, thank you for all the advice. I am blessed to have a property where I can raise goats, chickens, and rabbits. But I also live down the road from the only organic raw cow dairy in Arizona. She feeds the cows organically raised alfalfa and puts EMs in the water. No hormones are used and if a cow needs antibiotics she is culled from the herd. She gives aways the manure. I love your blog. You are an inspriration for me. Luck you! I had a great source for very aged cow and horse manure. It was fabulous stuff. Unfortunately, I think the supply is depleted. 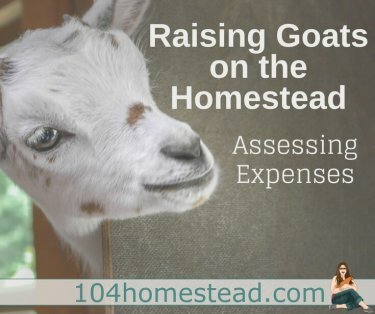 I’ll have goat manure next year, but not aged. I have more chicken manure than I know what to do with. My neighbors visit with empty buckets and leave with them full. Google “persistent herbicides”. You need to know that your hay, grain, straw, grasses, etc were grown on fields that were not sprayed with certain broadleaf herbicides that persist in the soil. They persist in animal manures and are not destroyed by composting. They may also be present in commercial compost. Know what you are using! I learned the hard way! I honestly had no idea that manures were different! That explains why the horse manure seems to work better then the chicken manure though! Thanks for the info! I love compost/manure tea. My dad made me a wishing well style tea maker with a spigot for using a low pressure hose or for filling a watering pail. Hey there, I have my share of chicken manure mixed with wood shavings and straw. But I also have sheep and llama manure mixed with hay and straw. Last of all I have piles of just plain llama poop. Can you say a few things about these and/or direct me to a good source of how to use this in my gardens. Thanks.